One of the attorneys I work for loaned me a copy of Dead Wake. It had been on my radar since before it was published, because Larson is a respected pop-historian and I enjoyed his prior offering Devil in the White City, which read like a tightly-plotted fictional thriller. 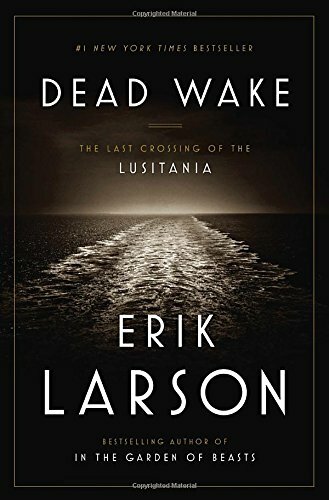 Still, I’m not a big non-fiction reader, so prior to chancing upon this borrowed copy, Dead Wake had sifted down to the bottom of my to-read list. It was an enjoyable read in that I like filling in holes in my education. It was a bummer of a read in that a lot of innocent people died, including women and children. Larson hits the pathos hard with well-chosen quotes from survivors, including some vivid and lasting imagery. I ended up reading the most intense scenes—in which the boat is hit by the torpedo and goes down—right before bedtime, which was some unfortunate timing on my part. Afterwards, I lay blinking into the dark, thinking about the fleeting and arbitrary nature of life and death. Not what you want to be pondering on a Sunday night leading up to your work week. Larson is clearly a motivated and thorough researcher. If you are particularly interested in oceangoing vessels or the politics of the world wars, you will probably find Dead Wake to include just the right level of detail. By the time you turn the last page, you will know a hell of a lot about submarines. If “more submarine knowledge” isn’t high on your list of desirables, you’d probably be better served to seek out one of Larson’s other works. TagsAcross the Pond, Americans Abroad, Code Breaking, Fill in the Holes in Your Education, Journey to the Past, Political Intrigue, War! What is it Good For?